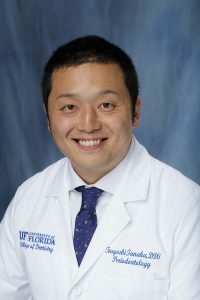 After recently completing an implant fellowship at the University of Florida College of Dentistry, Tsuyoshi Tanaka, D.D.S., M.S.D., a clinical assistant professor and periodontist, joined the college faculty on October 15, 2018, and is serving as the program director for the periodontology aspects of the DMD curriculum. He is also working with the periodontology graduate program, providing patient care in the college’s Faculty Dental Practice and pursuing his research interests. Tanaka earned his dental degree from the Tokyo Medical and Dental University in Japan in 2010 then attended the Indiana University School of Dentistry where he earned a certificate in periodontology in 2016 and served as chief resident. He also earned completed an Advanced Education in General Dentistry program in 2017 at Boston University’s Henry M. Goldman School of Dental Medicine. From 2011 to 2013, Tanaka worked in private practice in Japan before moving to the United States to further his education. He is a Diplomate of the American Board of Periodontology and also completed intravenous sedation certification. If you would like to make an appointment with Tanaka for periodontal care, please call our Faculty Dental Practice at 352-273-7690.